Stress Test is a series about the science behind our busy lives and how stress affects our bodies. The biweekly column uncovers the latest research and explains how to put it to use in a practical way. Look for the science behind epigenetic markers of stress, mindfulness, meditation and deep brain stimulation. Look around—are you feeling stifled by your cluttered desk, antsy about your full sink or stressed about your packed closet? That mess is wearing on you, recent studies say. Noisy, disorganized settings can clutter up your brain as much as the physical space around you. In neuroscience terms, having all that stimuli is distracting. Sleeping in an untidy room can even affect the quality of sleep you get. This may be particularly true for stressed-out gals on the go. A study by the University of California at Los Angeles’ Center on Everyday Lives and Families looked at the relationship between 32 families and the thousands of objects in their homes. The top conclusion? They found a link between high stress levels (measured through cortisol) in female homeowners who had a high density of objects in the house. Essentially, more stuff equals more stress. The great news is that a quick pickup seems to do the trick. 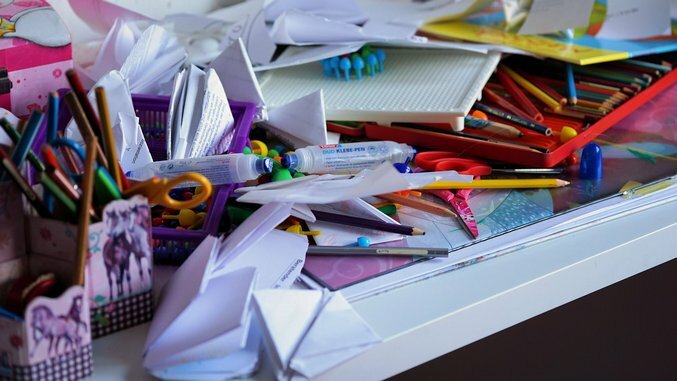 Five minutes of decluttering every few hours adds up and quickly transforms a space, the UCLA researchers suggest in their book, Life at Home in the Twenty-First Century: 32 Families Open Their Doors. In fact, in recent years, developers have released several apps to take a more high-tech approach to ditching stuff and cleaning up junk. The best part? They’re all free. Download them in a snap and easily delete the ones that don’t help. Create a visual inventory by taking photos of your items. Sort them into categories by location (such as the closet or garage) and tag them for searching later. You can even add details about the warranty or purchase date and store. If you’re moving, this could be a great way to keep track of what’s in which box. If you have kids, this one may be the app for you. Cleaning isn’t fun for anyone, but that’s doubly so for kids as you’re trying to teach them good habits. The app turns tasks into games, and parents can create chores that offer different rewards, such as an hour of playtime or a trip to the store for a toy or treat. Kids can use the app to track their tasks, earn points and see rewards. As the app suggests, learn to let go of your items. This one, in particular, tries to help you by removing as many barriers as possible. It uses image recognition and artificial intelligence to instantly identify items from your photos and write the headline for you. It also tags them and allows buyers and sellers to message each other with typical phrases such as, “Yes, still for sale” and “What price?” The app also posts to social media and allows you to customize them in goofy ways, such as creating an action-movie trailer for what you’re selling. Tackle all the clutter tasks — clean a room, decorate a room, organize bookshelves and create lists. Set reminders to change air filters, check smoke alarms and organize certain rooms at certain times of the year. With a Pinterest-style interface and created by Angie’s List, you can save household cleaning tips and articles on choosing the right furniture for different rooms in the house. For the already converted declutter fans, KonMari is the new app released by Marie Kondo, author of the best-selling book, The Life-Changing Magic of Tidying Up: The Japanese Art of Decluttering and Organizing. The book, which has been translated into more than 40 million languages and has sold more than 7 million copies, encourages cleaners to only keep items that “spark joy” in their lives. The app organizes your home into five categories to tidy up — clothing, books, papers, sentimental items and komono (miscellaneous items). Use checklists to track progress, set due dates, send reminders, and take before and after pictures to share. Carolyn Crist is a freelance health and science journalist for regional and national publications. She writes the Escape Artist column for Paste Travel, On the Mind column for Paste Science and Stress Test column for Paste Health.